Welcome to your one-stop solution for DISC personality assessment. Discover why thousands of customers give our test the thumbs up. For over twenty years, we have supplied psychometric solutions to all sizes of organisations from Fortune 500 companies, FTSE corporations, and government agencies, through to small- and medium-sized enterprises all over the world. Regardless of your assessment needs, our profile service is scalable to provide you with exactly the solution you need. Personal qualities like drive, motivation and social skills are critical success factors. DISC is a powerful behavioural tool that builds a profile of working behaviour that helps you choose the right people and be sure they function at their best. DISC is the perfect Job Matching tool, with a reference library of nearly 250 different roles. Simply create a Job Profile to describe the behaviour needs of your job, and the Job Matching feature will help you find the right person quickly and efficiently every time. Working relationships are just as important as individual skills and abilities. Assess and understand personal dynamics to cultivate more effective interaction, resulting in higher productivity and job satisfaction. Helps build productive and effective working relationships. Our Team Profile service is capable of combining any number of personality profiles to model effective new teams, or explore the dynamics and team roles at work within any group of people. We provide a truly comprehensive range of reporting options. Personality profile reports are affordably priced based on content, ranging up to the Enhanced Report with more than thirty pages of dynamic content. All our report content is generated by an intelligent reporting system, based on millions of possible combinations. Profile report with DISC and trait assessment, general textual report and optional Job Match. Profile report with all Classic content plus eleven extra topics of more specific textual analysis. Introductory-level profile report designed to be read by the candidate about their own results. Job Match assessment for a candidate against a particular role. Included with standard DISC reports. Job Profile assessment for standard or custom profiles, including personality requirements. Relationship assessment for two profiles, describing the working relationship from both viewpoints. Team report for any group of profiles, including team dynamics, roles, leadership analysis and more. Minimal profile report for expert users, including only DISC profile data and an optional Job Match. Our DISC solution includes a comprehensive branding and customisation service, enabling you to apply your own logo and colour scheme to all its key features. Apply your corporate livery throughout the candidate experience, including your online profile portal, questionnaires and even reports. Produce DISC questionnaires for use on screen, online, or in printed form. All of these questionnaires are available in a wide range of language options, shown below. 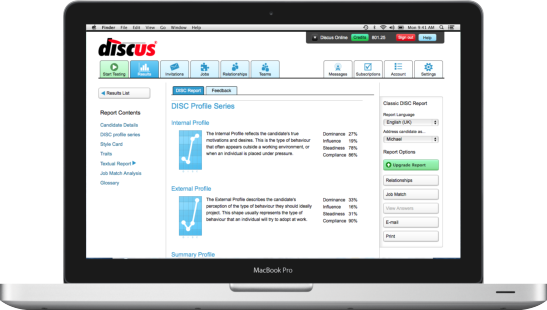 Whatever your personality profile needs, we have a DISC solution for you. Create psychometric profiles online or through unlimited questionnaires, assess and report on the results immediately. Our reports provide comprehensive, in-depth behavioural information in rich graphical and textual detail. Our profile service is designed to operate on any device, from your desktop or laptop to a mobile or tablet. Use it directly online, or install one of our suite of profile apps to provide the experience you need. Complete a questionnaire on one device and view the results immediately on another, all managed for you through the cloud. 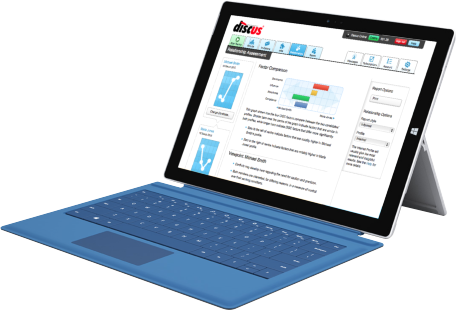 You'll discover a host of free and unlimited features to help manage your DISC assessments. Create your own Job Profiles (or choose from our extensive library) to match any candidate against any job, or combine your DISC profiles to examine working relationships or the dynamics and team roles at work within groups of individuals. Our DISC test service includes a range of unique and sophisticated team assessment features. You can combine any group of DISC profiles to create a team, and create an extensive team report covering all the major roles and dynamics at work within that team. We can even assess and report on leadership issues within the team. An Introduction to DISC is a completely interactive online video course covering the DISC psychometric system and its interpretation. The course includes self-testing, as well as certification of completion. This video certification course will guide you through all the most important facts and features behind DISC, taking you from first principles to the point where you can actively interpret DISC results for yourself. How do I get started with DISC? Just take a few minutes to run through our simple registration process, and you'll be ready to get started right away. You can choose from a range of packages with different options, from the basic Core package up to the Ultimate package that includes extra features such as personalised branding and a free Certification Course. 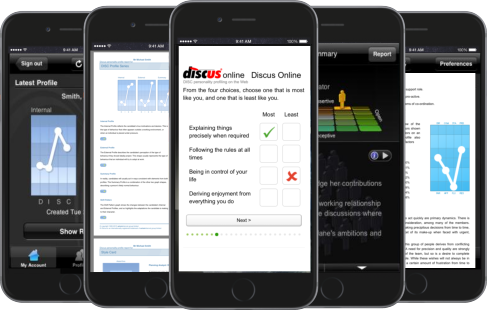 Our personality test is based on DISC theory, one of the best established commercial profile systems in use today. The core personality profile measures four fundamental factors: Dominance, Influence, Steadiness and Compliance (from the initials of which we get 'DISC'). Extrapolating out from these measurements we can derive specific interpretations covering a whole range of behavioural styles and their reactions to different conditions. If you'd like to find out more about DISC, you'll find a useful introduction on our What is DISC? page. How does a DISC questionnaire work? A standard DISC assessment contains twenty-four multiple-choice questions. Questions are typically presented to candidates using an interactive questionnaire, which can be used to complete profiles across the Web. We also provide the option to print an unlimited supply of paper questionnaires. Completion time can vary according to the particular type of questionnaire used and according to the individual candidate. In general, however, a questionnaire will take about ten minutes for a candidate to complete. What does a DISC test cost? The service itself is free to use; you only pay for the profiles you create using the system. As part of your registration, you'll be provided with a set of credits so you can start creating profiles right away. 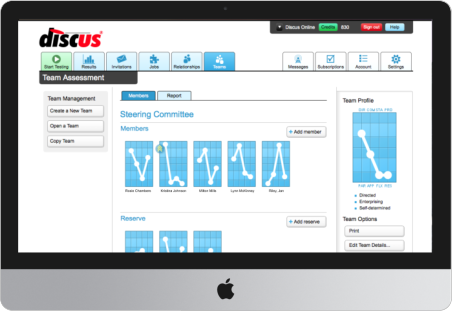 Extra features like Job Matching, Relationship Assessment and Team Building are all available for unlimited use at no extra charge. You can find full details of our charging scheme on our Pricing page. At the simplest level, one credit is the price of a Classic profile report; that is, for one credit you can create a comprehensive overview report for any DISC profile. Reports with different content are charged at different credit rates, so the more detailed Enhanced report costs two credits, while the basic Outline report costs just three-quarters of a credit. You can upgrade between report levels at any time. You can prepurchase credits ahead of time to ensure that you're always set up ready to create profiles, and there are significant discounts available for volume credit purchases. No. Once you purchase credits, they remain on your account until you use them, with no expiry limit. Is DISC a validated test system? A full report on the validity and reliability of our psychometric assessment is available in the Roodt Report. See our Validity and Reliability section for full information. Can I create my own DISC profile? If you just want to see your own DISC personality assessment, you can do that without signing up for the full package. We can provide a single profile questionnaire directly through this site, but note that this is designed for you to answer about yourself and create your own personal report. We don't recommend this service for creating profiles of other people; in that case, registering for the full service is the best course of action. If you have a question not answered here, just send us the details using this quick form and we'll contact you with the answer as soon as possible. Thank you. Your question has been sent, and we'll be in touch with an answer as soon as possible.